Clare Wa ight Keller is taking Givenchy into unprecedented territories. 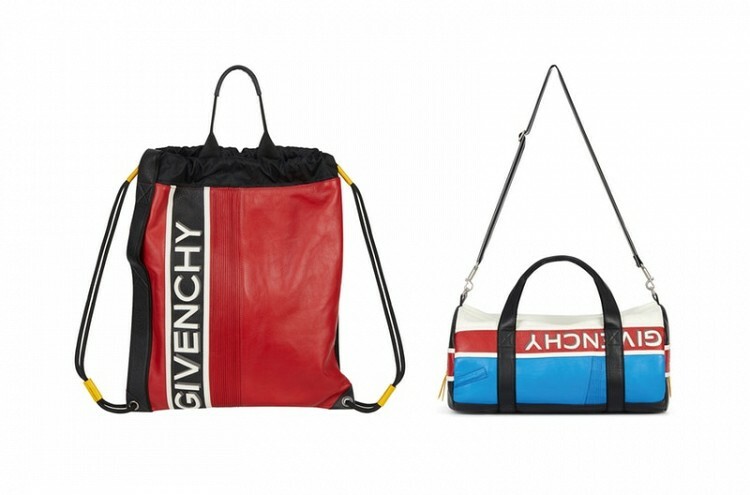 Ahead of the brand’s sporty and furry Men Fall/Winter 2018 collection, Givenchy released a brief selection of motocross-influenced gear for its Fall 2018 pre-collection. Dubbed “MC3” as a nod to its motocross influences, the release encompasses accessories and ready-to-wear, replete with branding and bold accents of color. Recognizable touches from motocross uniforms are transposed into the pre-fall range. A windbreaker, tee and sweater offer stylized Givenchy branding along with bright blue and red details on a white base. A pair of sneakers accompany the clothes offering, as well as slide sandals and two shoes detailed with inverted branding on the rear, which matches the occasionally-inverted logos on the bags. Along with a substantial duffle, the collection includes a small variety of shoulder and waist bags, all executed in hard-wearing leather, with the requisite black bases elevated with colorful panels and striped patterns.